One of the biggest financial issues people deal with is debt. If you’re like me and want your debt gone ASAP, you definitely have the right idea, but it’s important to avoid several potentially costly mistakes when paying off your debt. Making certain mistakes when paying off your debt can actually deter you from becoming debt free and cause you to lose money. Here are five common mistakes you should avoid. When you start paying off your debt, it’s always important to have a strategy in mind. A strategy can help you stay motivated and focused on your goal and allow you to scale your progress. Assess your current situation along with your current needs and wants. How much debt do you have and how much money are you bringing in each month? Will you consolidate or refinance your debt? When can you realistically see all your debt being paid off? These are all important questions to ask yourself as you determine the right strategy. Some people like to throw all the extra money they have toward their debt while others like to take their time and invest more if they have low interest debt. Figure out if you want to attack the high interest debt first or the debt with the largest balance (commonly referred to as the avalanche method), or start with the debt with the smallest balance first and then roll your payments onto the next debt once it’s paid off (commonly referred to as the snowball method). In addition to developing the right strategy that works for you, you need make sure you aren’t paying off the wrong debt first. Whether you choose to utilize the snowball method, avalanche method, or a mix of both to pay off your debt, you need to make sure you are starting the process in a way that allows you to make the most progress over time. For example, if you have $8,000 in high-interest credit card debt and $20,000 in student loan debt, and you want to save money on interest, you should choose to start paying off your high interest debt first, which is the credit card debt, even though it’s the lowest balance. Since your student loans probably won’t accrue nearly as much interest as the credit card debt will over time, it makes sense to knock that out first before you tackle your loans if you are interested in minimizing interest payments. If you view paying off your debt as a priority but wait to make your debt payments last each month, you could be making a big mistake. Paying on your debt first each month right after you get paid is the best practice, even if your minimum payment isn’t due until later in the month. Unexpected expenses pop up all the time and there’s no telling how much money you’ll have leftover at the end of the month. If you’ve budgeted to make extra payments on your debt, it’s a good idea to get that out of the way early in the month as well. You can set up automatic recurring payments each month to make sure you stay on track. Are you paying off your debt but still taking out loans or using credit cards unwisely? If this is the case, unfortunately, you’re probably not making that much progress. When you get serious about paying off debt, you need to go cold turkey on your credit cards and avoid financing anything or taking out any loans. By continuing to accumulate different types of debt while making monthly payments on your existing debt, you are ultimately canceling out any progress you make and preventing yourself from moving forward. The only exception I have for using credit cards while you’re paying off debt is if you’re using them to pay for regular expenses you need to take care of each month and paying off the balance in full each month. For example, I don’t personally have any credit card debt, but I’m aggressively paying off my student loans, so I still use a credit card solely for fuel for my car and groceries each month. If I didn’t have the card, I’d be paying for those expenses with cash anyway, so it made sense to me to use my card so I could earn reward points and pay the bill off in full each month. I don’t resort to using my card for things like shopping sprees or extra outings with friends. Even with this strategy, it’s also important to minimize your usage of credit cards no matter what and stick to a mostly cash budget when paying off debt. Paying off debt can take months or years depending on your situation. It takes lots of dedication and certain sacrifices, so it’s no wonder why most people lose motivation in the middle of their journey. This is why it’s important to know your ‘why’ and believe in it wholeheartedly. Ask yourself why you are eager to pay off your debt, who benefits from it, and how it will improve your life and finances. Having a clear understanding of your why will help motivate you when times get rough and things don’t go as planned. Also, surrounding yourself with positive people who have the similar goals as you can help you maintain your motivation as well. 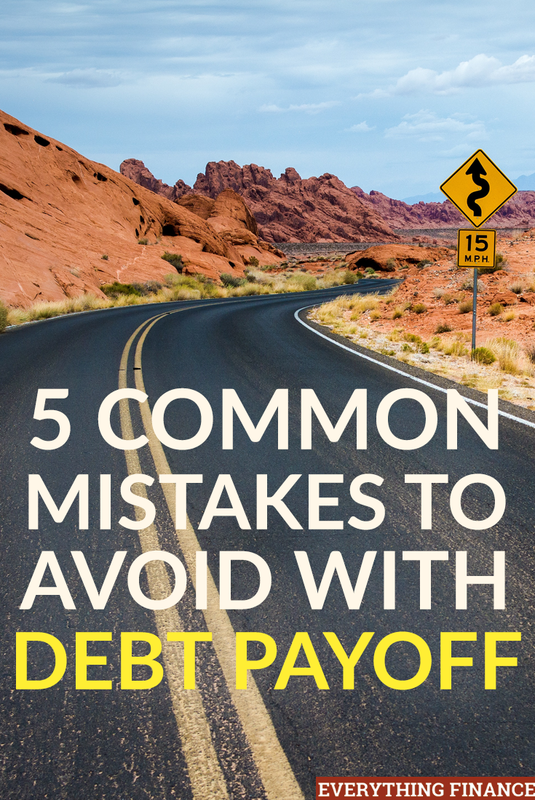 Have you ever made any of these mistakes when paying off your debt? How did you turn things around?